Although there is a surge in early stage personal and service robotics activity right now, it will take time to find out which technologies and companies will be the real winners, and only then will we learn the real affect on the overall jobs picture. I do believe, though, that we will see a new set of ROI’s emerge that will alter the jobs landscape, resulting in new jobs in a growing US-based robotics industry, as well as new job skills required to work synergistically with safe service robots. The success of a start-up is based on management ability, and it will take time to see which companies have the technology, target market, and team to succeed and create jobs. At this stage, I don’t think the core technology is the primary differentiator for the success of emerging companies. One aspect of robotics commercialization that is often highlighted, but often overlooked, is the fact that the actual business value of a robotics company can take many years to validate. The existing base of successful robotics companies, Intuitive Surgical, iRobot, etc., all took close to a decade or more to become successful. The basic premise is that low-cost hardware is helping to support more startups. But the success of a start-up is based on management ability, and it will take time to see which companies have the technology, target market, and team to succeed. Going forward, these teams will be the ones that reveal the real value of robotics, and the resulting impact on jobs. I think there are two trends for management teams to watch regarding jobs and the emerging personal robotics market. The first is New Efficiencies. In this case, emerging robotics technology is integrated into emerging markets as part of the overall business model and bottom line performance. In this case, there is a growth trend with respect to a new market, and robotics plays a role in the success of the emerging business solution by automating key activities that keep costs down. The jobs story in this case is usually a good one. New jobs are created as companies succeed. This is what is happening in the warehouse logistics market right now. Driven by the competition to provide same day delivery, Amazon, Wallmart, Target, etc. are all building out new distribution facilities closer to population areas. Robotics technology (Kiva is a well-known example) is being used to create super efficient product handling. These new warehouses become a source of jobs, although with different requirements than the traditional warehouse job. The second trend, and the one that is more compelling to me, is High-Value Gap Filling. In this case, the robot product works closely with a skilled human operator to augment the operator, performing functions that would not be done easily otherwise. 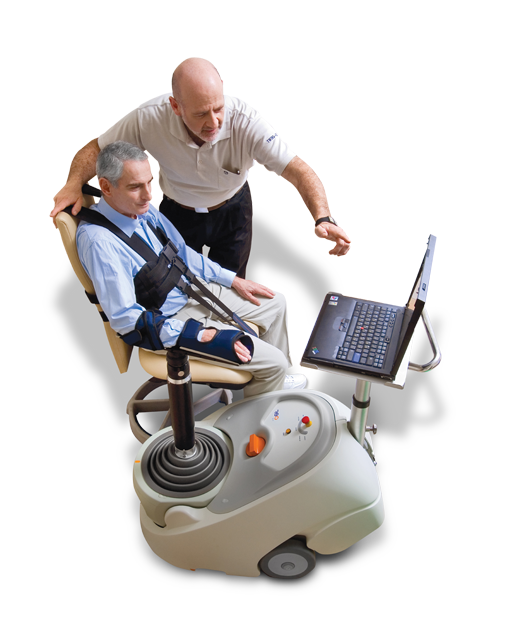 I spent several years introducing a robot to support therapists working with stroke patients to rehabilitate arm function following a stroke. Our product focused exclusively on arm therapy, where it has been shown that intense rehabilitation can lead to better outcomes than were traditionally thought possible. The device is used by patients to perform hundreds of engaged arm movements per therapy session. Therapists know how to perform this type of therapy, but the current treatment landscape, which is very complicated for stroke recovery, rarely has room to just focus on arm movements, and actual arm engagements are in the dozens per session. In this case, the robot helps the therapist help the patient, but in no way could replace the therapist’s knowledge and experience. A related example of Gap Filling is the use of robotics to address needs in agriculture. The opportunities are in part driven by the lack of available labor resulting from recent changes in immigration policy. It is likely that the labor market in agriculture will be impacted going forward. Remember also, that the robotics market is where personal computing was back in the 1980s. Few would have been able to predict the types of jobs that would emerge related to personal and mobile computing, social networking, etc. Robotics has the potential to result in similar game-changing new markets, with similar implications on the jobs market. Only time, and innovative management teams, will tell.